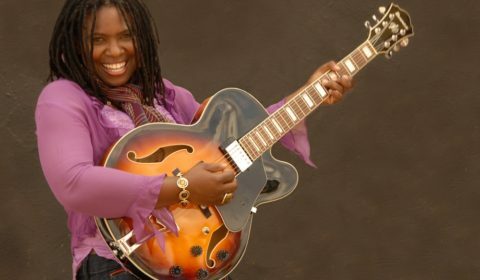 Multi blue award winner Ruthie Foster brings her gospel to Peter’s Players Aug. 8 with rich, diverse musical history. GRAVENHURST — A girl and her guitar. A simple concept brimming with promise. That’s Ruthie Foster tonight, (Aug. 8) at Peter’s Player’s. On the road, a troubadour with a deeply personal message. The east Texas singer is alone on tour and making a stop in Gravenhurst to spread her own gospel. The gospel of Ruthie Foster. She’s in between two days each at festivals in Canmore, Alta., (Sunday and Monday) and Lunenburg N.S. (Thursday and Friday), followed by Kitchener Saturday, then back to the Columbus, Ohio, and Newport (Kentucky) next week. MuskokaTODAY.com caught up with her last week in a call to New York City, where she performing at yet another summer festival. A single mom who has graced stages from the deep south to the near north. “And somewhere out there on YouTube,” there’s video of her on stage at the famed Austin Limits TV. If you Google her, you’ll find her rubbing shoulders with friend Bonnie Raitt. Foster says Raitt usually gives her a call whenever she’s in Texas and they get together. Foster, who combines her slick guitar picks with her soulful singing, will be playing from and promoting her most recent CD Joy Comes Back. Hers is a message of hope. She says not everyone from Texas is conservative and Republican. And she’s out on the road hoping people can relate to her story of personal and professional comeback. For she’s seen and experience the good and bad times it takes to sing the blues. The multiple blues award-winner has a beautiful voice, an engaging stage presence and rich, divers musical background. The U.S. Navy retiree is even getting back to her big band roots, which she sang in the military. Later this year she will be a vocalist with a big band. For now, she’s out full of joy at her comeback.